1.Whisk yogurt with besan, turmeric powder, red chili powder, coriander powder and one cup of water. Ensure that there are no lumps. Clean, wash and chop coriander leaves. 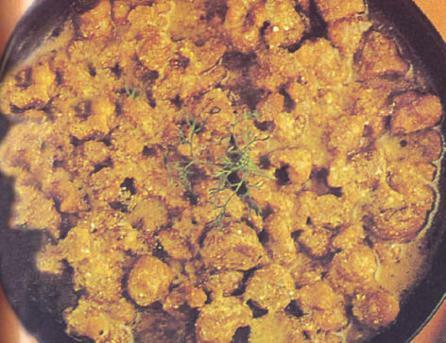 2.Heat a non-stick frying pan and dry roast the mangodi, stirring continuously till they turn golden brown. Remove and keep aside. 3.Heat oil in a pan. Add mustard seeds and asafetida, cumin seeds, fennel seeds and fenugreek seeds. When they begin to crackle, reduce heat and add yogurt mixture and salt to taste. 4.Stir well and bring it to a boil. Add mangodi and chopped coriander leaves. 5.Reduce heat and simmer till mangodi are soft and cooked. This requires approximately eight to ten minutes. However this time can change depending on the quality and size of mangodi that you use. Note: Readymade sun-dried mangodi are readily available at grocery stores.